Well, I was flat out wrong! It is an oak tree called a shingle oak. Interestingly enough, I was in Kentucky a couple weeks later and found several more, all bearing acorns. It's amazing what you see when you know what you are looking for. Shingle oaks grow from about Middle Tennessee up to the southern tip of the Great Lakes in Missouri, Illinois, Indiana, Ohio, and Western Pennsylvania. 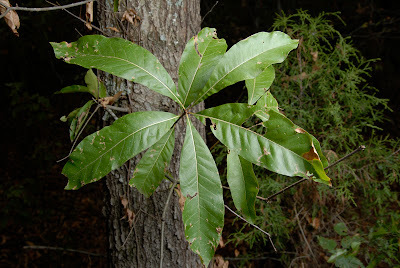 They are found in moist soils near water, often growing with post oaks and black oaks. 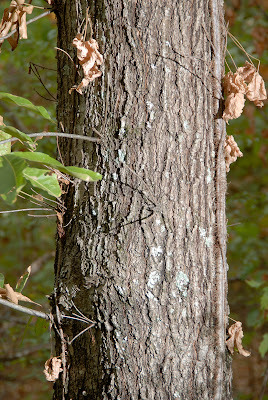 The bark is smooth in small trees but becomes rough and deeply furrowed in larger trees. You'll have to forgive the poison ivy on this specimen. It was the only one I had available to photograph. 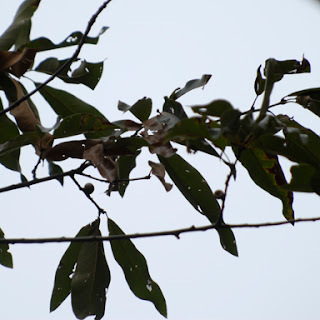 Identification of this tree based on the leaves is pretty easy. They are 3" - 6" long and shaped like a spear tip. They are shiny green on top with a yellow mid-vein. The nuts that are pictured here are still immature. 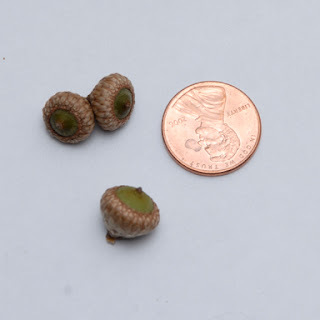 The acorn shell will grow out further from the cap in a fully-developed specimen, but you can get the sense of how small they are.